Cleanings and checkups with Gustafson Morningstar Dentistry in Royal Oak are essential to your dental health, and to your overall health. By coming into our office every six months, you’ll get the peace of mind that comes with knowing your teeth and gums are healthy – and you’ll have a great smile, to boot. A typical appointment is in two parts. First, one of our hygienists gives your teeth a thorough cleaning. That in itself is worth coming in for. But part two, the checkup, is just as important, because we’ll take x-rays, check for any cavities, make sure your gums are healthy, and look for signs of any problems like bruxism, also known as teeth grinding. Seeing us twice a year is also a great way to protect your overall health. We won’t give you a physical like your doctor, of course. But there are more than a hundred systemic diseases that can be detected in the mouth. In between visits, make sure to do your part. In fact, a daily regimen of flossing and brushing is the most important part of the equation. We recommend brushing at least twice a day; after every meal is even better. That way you are consistently removing the plaque that is constantly forming on your teeth. If you haven’t scheduled your next checkup and cleaning with Gustafson Morningstar Dentistry in Royal Oak MI, pick up the phone and give us a call. 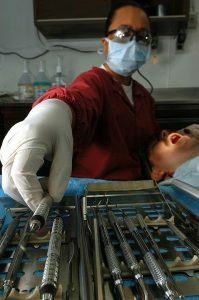 We provide general and cosmetic dentistry, dental implants, and other services. Make an appointment today.